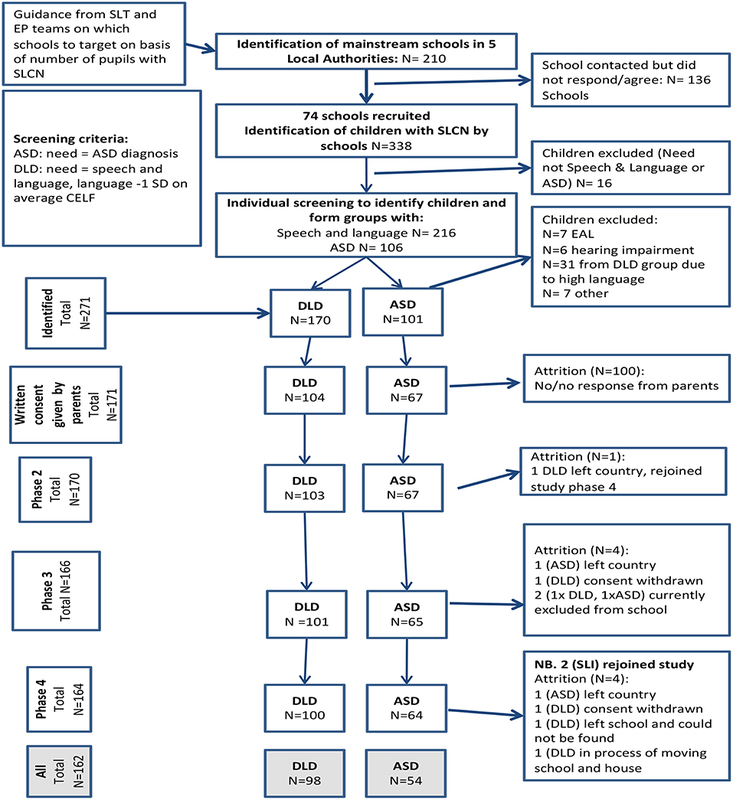 What Drives Educational Support for Children With Developmental Language Disorder or Autism Spectrum Disorder: Needs, or Diagnostic Category? A central conceptual change in the Warnock report, the first type report of a UK government committee on the education of children and young people with all types of special educational needs (Department for Education and Science, 1978), was the shift from categorization of children and young people by handicap to the identification of individuals' special educational needs (SEN). However, the focus on categories has persisted. In this paper we examine the relationship between the educational provision made for children with SEN in relation to diagnostic categories as opposed to assessed needs. We draw on data from one of the studies in the Better Communication Research Programme which was commissioned by the UK government in response to the Bercow Review (2008) into provision for children and young people with speech, language and communication needs. Data were collected from 74 mainstream schools in England about the support provided to two groups of children with identified SEN (N = 157, Mean age 10;2 years): those with developmental language disorder (DLD) n = 93 and those with autism spectrum disorder (ASD) n = 64. Information was collected about school support and support by external professionals (speech and language therapists (SLTs), educational psychologists and other support services). The type and level of support provided was examined and the ways in which these differed between children with a diagnosis of DLD or ASD explored. We considered whether the support provided varied according to within child or contextual factors. In addition, change in the provision made over a 2 year time period was examined. To our knowledge this is the first study to concurrently recruit pupils with DLD and ASD from the same mainstream settings to examine differences and similarities in their profiles and the ways in which these impact on service delivery. The results demonstrated provision for children with DLD and ASD continues to be driven by diagnostic categories, and that children with ASD are significantly more likely to receive support from schools and SLTs, independent of children's language, literacy, cognitive scores and behavior. Driving amount of provision by diagnostic category limits the possibility of providing effective provision to meet the children's individual language and learning needs. This raises serious questions about the allocation of support resources and, by corollary, indicates the likelihood currently of an inequitable allocation of support to children and young people with DLD. The Warnock Report (Department for Education and Science, 1978) constituted the first comprehensive review of special educational needs (SEN) and disabilities in the UK. One of its main themes was a move away from the use of disability labels to a focus on children's needs. This was based in part on evidence from epidemiological studies that children may have two or more types of difficulties, and hence complex combinations of needs (Rutter et al., 1970). For example, children with significant hearing loss may also have significant problems with verbal and written communication, behavior, mental health, and learning; some might also have physical disabilities. In this paper we examine the relationship between the provision made for children with SEN in relation to diagnostic categories as opposed to assessed needs, drawing upon evidence from a study of children and young people with either developmental language disorder (DLD) or autism spectrum disorders (ASD). There has been continued concern about meeting the additional needs of children with SEN in mainstream settings. Children with DLD and those with ASD raise particular levels of concern, albeit for different reasons. For children with DLD there have been concerns about identification (Dockrell and Hurry, 2018) and provision of additional speech and language therapy (Ebbels et al., 2019), while for those with ASD concerns have been raised about managing behavior (Lindsay et al., 2013) and support for difficulties in social communication (Roberts and Simpson, 2016). For both groups of children, the need for additional support, the manner in which this support is provided, the scarcity of trained professionals to work with pupils, and the limited evidence base underpinning effective interventions have raised concerns among researchers, professionals, and parents. Yet to date there has been no attempt to map support provided to pupils with these different primary needs in mainstream settings and to examine the support in relation to their performance on standardized measures of language, literacy, cognition and behavior, restricting the evidence base to inform models of practice. Drawing on data collected from a cohort of pupils identified in mainstream settings with either DLD or ASD, as part of the Better Communication Research Programme (BCRP: Dockrell et al., 2014), we examined the support that was provided to the pupils by school staff and speech and language therapists (SLTs). We further considered whether the manner (in class, small group, or individual) and amount of support that was provided were related to their diagnosis, age group, or level of need as indicated by measures of language, literacy, cognition and behavior. Finally, we examined changes in reported levels of support over time to ascertain the extent to which schools and speech and language therapy services continued to provide support to the children, given the accumulating evidence that these problems would continue throughout the pupils' time in schools (DLD: Ebbels et al., 2019; ASD: Adams et al., 2016). The main focus of the Warnock Report with respect to support of children and young people with SEN was at the level of structure and organization (Department for Education and Science, 1978). A substantial part of the report discussed principles, conceptualization of SEN, inclusion, and services. In each case there was relatively little content regarding the micro level of how children and young people with SEN should be identified and supported. For example, the need for teachers and pupils to receive support, was stressed (para 8.45) and the roles and functions of the Advice and Support Service (Chapter 13) and that of educational psychologists and other external services (Chapter 14) were explored, but not direct support for children. Even Chapter 11, “Curricular Considerations” had little to say on that subject. To enhance the attainments and opportunities for pupils with SEN it is necessary to capture their needs and consider how this impacts on the support that they are provided with. At the time of the present study there were two levels of additional support in mainstream schools for pupils with SEN: school action and school action plus arranged within the school from its own resources but including visiting professionals e.g., educational psychologists; and, secondly, provision specified by the local authority (LA) in a statement of SEN, following a statutory assessment. Under the new SEN legislation (the Children and Families Act, 2014) school action and school action plus have been replaced by SEN support, and statements of SEN by education, health and care plans (EHC plans: Department for Education, 2015), Support for children and young people with DLD or ASD is provided in a range of ways, from the level of school provision: specialist provision within mainstream schools (resource bases) and specialist schools;; to the individual level: e.g., individual or group support, speech and language therapists (SLTs), peripatetic specialist teachers, and pedagogical approaches including special manualized teaching and learning programmes (Roulstone et al., 2012). We explore the support provided for children and young people in mainstream schools who were identified with either DLD or ASD and whose needs were addressed at School action plus or by a statement. We explore the support provided in a large sample of mainstream schools and the relationship between the provision made and their primary diagnosis (DLD or ASD). Concerns about the levels of support and the ways in which this is provided to pupils with DLD are not new (Lindsay et al., 2010; Bishop et al., 2012). Attention has been drawn to scarcity of speech and language therapy services and also specialist provision, particularly for pupils in secondary education (Lindsay et al., 2005; Dockrell et al., 2006) and this has led to considerable debates about the ways in which the pupils' needs should be identified and supported (Ebbels et al., 2019) in the context of the limited training and knowledge base reported by teachers (Roberts and Simpson, 2016; Dockrell et al., 2017). There is also increasing recognition that many children can experience difficulties with oral language, including children with ASD for whom this is often a co-occurring problem (Dockrell et al., 2015). In addition, there have been major debates about the etiology and classification of children and young people with language and communication difficulties. Until recently, the dominant distinction was between children who had “specific language impairment” (SLI) and others with similar difficulties but who met specific exclusion criteria, in particular that their general cognitive ability was at a lower level (often defined as −1SD). However, critical examination of the research evidence did not support this (Bishop, 2014), leading to a consensus being reached, following a major Delphi exercise, to use the term “developmental language disorder” (DLD; Bishop et al., 2016, 2017). The term, DLD, is now being used by many researchers and practitioners. However, it covers a wider group than the earlier SLI (Bishop et al., 2017); in particular there is no restriction for inclusion on the grounds of lower general cognitive ability. Within the education system in England, however, the term “speech, language, and communication needs” (SLCN) is the official term by the Department of Education (2015). This is broader than DLD, including, for example, children and young people with speech difficulties. While debates about diagnostic criteria to identify DLD raise problems for researchers and practitioners alike, there is also increasing interest in comparing the profiles of children with DLD and ASD. The potential overlap between the two cohorts has been a matter of considerable debate (Bishop et al., 2000; Williams et al., 2008). DLD is primarily associated with structural language impairments whereas social communication (pragmatic) impairments are typically thought to characterize ASD. There is, however, increasing evidence that the boundaries between the two disorders are not clear (Bishop, 2003), including our own work on writing (Dockrell et al., 2014), behavioral, emotional, and social difficulties (Charman et al., 2015), and work by others on the well-established difficulties with structural aspects of language that children with ASD experience (Kjelgaard and Tager-Flusberg, 2001). Developmental language disorder is more prevalent than ASD (Bishop, 2010). However, ASD remains the more well-known condition and the one which attracts the most research funding (Bishop, 2010), although the majority of funding for ASD supports basic science including genetics and cognitive systems (Singh et al., 2009). By corollary, twice as many children in England have a statement of SEN or an education, health and care (EHC) plan for autism than they do for SLCN (28.2 vs. 14.6% of children with a statement or EHC plan: Department for Education, 2018a). Indeed, ASD is the most prevalent primary type of SEN category across ages 4–17 for those pupils with a statement or EHC plan (Department for Education, 2018a). Language skills in ASD are variable. While some individuals with ASD do not have obvious difficulties with language, others have language skills which mirror profiles typical of children with DLD (Simms and Jin, 2015); although higher general cognitive ability is associated with better language in ASD populations (Magiati et al., 2014), language skills can be independent (Kjelgaard and Tager-Flusberg, 2001). Nor does it seem to be the case that the language difficulties of children with ASD are less severe for expressive rather than receptive language as might be predicted because of their reported difficulties with pragmatics. Kjelgaard and Tager-Flusberg (2001) found no differences between expressive and receptive tasks which tapped higher order knowledge of syntax and semantics, although single word naming was a relative strength. However, in ASD, speech production can be preserved and there is some indication that pupils with ASD are better at sentence repetition than those with DLD (Whitehouse et al., 2008). Thus, pupils with ASD are at risk of language difficulties but typically do not have problems with speech. The increased association between language difficulties and ASD has been captured in DSM-5 where autism can be diagnosed with or without language impairment (American Psychiatric Association, 2013; see also Loucas et al., 2008). ASD features have also been documented in samples of children and young people with DLD (Bartak et al., 1975; Bishop et al., 2000; Conti-Ramsden and Botting, 2004; Dockrell et al., 2015). For example, 41% of a DLD sample (total n = 45) met ASD criteria for social communication impairments on measures commonly used to diagnose ASD (Leyfer et al., 2008). Pupils with DLD in this study showed difficulties in social behaviors including not showing appropriate interest in other children and failing to spontaneously imitate actions. However, repetitive and compulsive behaviors were seen rarely in the language impaired sample. Overall, the evidence suggests that there is significant overlap between the DLD and ASD populations in some core features, but it is less clear how these impact on the way pupils' needs are met in schools. To our knowledge this is the first study to concurrently recruit pupils with DLD and ASD from the same mainstream settings to examine differences and similarities in their profiles and the ways in which these impact on service delivery. Within the state school system of compulsory education for children and young people in England between 5 and 16 years of age, pupils with speech, language and communication needs (SLCN) (which includes DLD) comprise the second highest category of SEN: 22.8% of those receiving SEN support and 14.6% of those with an EHC plan or statement of SEN (Department for Education, 2018a). The most prevalent SEN group with an EHC plan or statement comprises pupils with ASD: 28.2%, whereas the percentage of pupils receiving SEN support is 5.7%. Furthermore, the prevalence nationally of pupils with SLCN (SEN support, or EHC plan or statement) increased over seven years (2005–2011) from 0.9% of all pupils aged 5–16 to 1.61%, an increase of 72% (Lindsay and Strand, 2016); and for pupils with ASD from 0.48 to 0.87%, an increase of 87% (Strand and Lindsay, 2012). This very high, and increasing, prevalence of pupils with either SLCN or ASD presents substantial challenges to the education system to provide appropriate provision which matches their profile of difficulties. Within schools in England the most common support for pupils with SEN in mainstream schools, including those with SLCN and ASD, comprises teaching assistants (TAs). Their number has grown substantially, reflecting the growth in the prevalence of pupils identified. Currently, TAs represent 27.8% of the national school workforce, compared with 47.7% who are teachers, with an increase from 219,800 TAs to 262,800 between 2011 and 2017 (Department for Education, 2018b). Evidence for the effectiveness of TAs, however, is limited and the major Deployment and Impact of Support Staff (DISS) study found a negative relationship between the amount of TA support received and the academic progress made by pupils in mainstream school (Webster et al., 2011; see also Muijs and Reynolds, 2003). However, the DISS study was only able to control for a small number of factors related to more TA support (e.g., prior attainment and SEN status) and did not examine individual pupils' knowledge and skills. It may be that children, despite having a similar SEN status, with greater levels of impairment were in receipt of TA support or that co-occurring difficulties, such as behavior/ attention problems, resulted in higher levels of support. Nonetheless, positive effects were found in Year 9 (13–14 year olds) in the DISS study, when there was a clear positive effect of TA support across all eight positive approaches to learning outcomes measured in the study: teacher ratings of distractibility, task confidence, motivation, task confidence, disruptiveness, independence, completion of assigned work, and following instructions from adults (Blatchford et al., 2009). Also, a review by Farrell et al. (2010) found that academic achievements of pupils of primary age who had learning difficulties showed significant improvement following a period of targeted intervention delivered by TAs. However, when the support was more general, results were equivocal, which suggests that support should be shaped by pupils' specific profile of educational needs. Indeed, a range of studies have demonstrated that interventions should be targeted directly to the child's area of difficulty than at a more generic level (see for example Bowyer-Crane et al., 2008). Given the significant number of TAs and their cost, the mixed evidence for their effectiveness is of great concern. Consequently, other research has sought to identify the specific elements of TA work with pupils that may have benefits, and training has been developed to assist the development of this substantial workforce (Webster et al., 2013; Sharples et al., 2015). It is also important to note that this research on effectiveness has been undertaken primarily on children with general learning difficulties, and behavior difficulties, rather than DLD or ASD. There is some evidence for the potential of TAs, or paraprofessionals in the U.S., with respect to helping pupils with ASD to improve their socialization (Koegel et al., 2014) and a range of learning, behavior and communication abilities (Rispoli et al., 2011; Brock and Carter, 2013). Speech and language therapists (SLTs) are key providers of support for children and young people with DLD. The SLT profession has developed its practice to work more in and with schools, allowing both the opportunity for direct therapy with individual children, group work, and also consultation with teachers (Law et al., 2002; Lindsay and Dockrell, 2002; Roulstone et al., 2012). In addition, a major review of the effectiveness of interventions provides SLTs and other teachers, and parents, with information upon which to plan appropriate action (Law et al., 2012, 2015) and which is available through the Communication Trust1. However, these studies have not mapped support to level of need. In this study we investigated the provision made for children and young people in mainstream schools with either DLD or ASD. This comprised part of a prospective longitudinal study within the Better Communication Research Programme (Dockrell et al., 2015). As part of the main study, we collected information on the pupils themselves and the context in which they were learning. 1. What type and level of support, in terms of school provision and SLT provision were reported to be provided and how did this differ with respect to the diagnostic categories of DLD and ASD? 2. How did the support provided vary according to within child language, literacy, cognitive and behavioral performance? 3. What change was evident over an 18 month time frame in the provision made? This study utilized a cross-sequential design, allowing both longitudinal (Time 1 vs. Time 2) and cross-sectional (pupils recruited in four school years) comparisons. Pupils from 4 year groups were identified in the initial screening phase, which began in November 2009. The majority of pupils (90%) were screened between November 2009 and July 2010 (2009/2010 academic year) when they were in school Years 1 (age 6), 3 (age 8), 5 (age 10), and 7 (12). The screening procedure is detailed in Figure 1. Data from a wide range of measures (see Measures) were then collected at Time 1 and Time 2 (on average 18 months later); with selected measures repeated across these time points to provide longitudinal data. Figure 1. Flow diagram showing inclusion criteria, exclusion criteria and attrition in the sample. At the time of the research, children in England with the highest level of SEN had a statement of SEN under the Education Act, 1996, which specified special education provision not normally made by the child's school from its own resources. Children with lesser but still substantial additional difficulties, which required support from specialist services from outside the school, for example an SLT or an educational (school) psychologist (EP), had a level of need designated as school action plus. In each case the primary need was specified and reported to the Department for Education through the school census. Recruitment to the sample was drawn from a screening of five Local Authorities (LAs) in the South East of England. To ensure comparability and representativeness there were three criteria which LAs needed to meet to participate in the study: (1) commensurate with national averages for the proportion of pupils with recorded SEN; (2) commensurate with national averages for the proportion of pupils with SLCN or ASD as their primary difficulty and (3) were at or above the national average for performance of pupils on combined English and Maths national curriculum tests at age 11. Across LAs, 210 mainstream schools were approached, 74 of which agreed to take part in the study. Following agreement from the schools, pupils were identified at the start of the study who were aged 6, 8, 10, and 12 years, attending mainstream provision and had SLCN or ASD as their primary SEN, according to their school. All participants spoke English as a first language and had no history of hearing impairment or uncorrected eyesight. Subsequently, we conducted a screening phase to ensure that participants from the SLCN group met criteria for DLD according to the fourth UK edition of the Clinical Evaluation of Language Fundamentals (CELF-4 UK: Semel et al., 2006; see Measures and Procedure below). Participants were identified as having DLD if they obtained a standardized score that was below the average range i.e., greater than one standard deviation below the mean < −1SD) on either the Recalling Sentences or Word Classes (total score) subtest from the CELF-4 UK. During screening we also administered the matrices subtest from the second edition of the British Ability Scales (BAS-II; Elliott et al., 1997) as a measure of non-verbal ability. During this phase, teachers were also asked to complete the Social Responsiveness Scale (SRS) (Constantino and Gruber, 2005) to confirm the clinical diagnosis of ASD and to use as a dimensional measure of autism symptomatology. The 157 school aged participants (M age = 10;2 years; SD = 2;2) comprised 93 with DLD (males 68: females 25) and 64 with ASD (males 57: females 7). Twenty-five percent of the participants were eligible for free school meals, an index of socioeconomic disadvantage. There were no significant differences in social disadvantage between participants with DLD and those with ASD [X2 (2, N = 154) = 0.21, ns]. Moreover, this percentage reflected the level of disadvantage of the schools and LAs from where the pupils were recruited. Data on ethnicity were available from the Department for Education for 115 pupils; of these 69 were of white heritage, 23 Asian 11 Black, and 12 mixed heritage. There was no significant difference with respect to ethnicity between participants with DLD and those with ASD [X2 (5, N = 112) = 0.24, ns]. Table 1 provides M (SD) and effect sizes (Cohen, 1988) for these participants on age, index of deprivation and the standardized measures of non-verbal ability, language (expressive and receptive), autism symptomatology, literacy (single word reading, reading comprehension and spelling), and behavioral, emotional and social difficulties (BESD) as measured by the Strengths and Difficulties Questionnaire (SDQ). Data for all standardized measures have been transformed to Z scores, which have a mean of 0 and a standard deviation of 1 to allow comparisons across all the measures, which use different standard metrics e.g., T scores, stanines and standard scores. These Z scores are derived from scores using the test normative samples and take into account the age of participants. For example, a Z score of −1 would equate to a standard score of 85 and a percentile rank of 10, while a Z score of −2 would equate to a standard score of 70 and a percentile rank of 2. Table 1. Participant characteristics for DLD and ASD groups. As Table 1 shows, the two cohorts did not differ in terms of age, index of deprivation, non-verbal ability or BESD. There were significant differences with large effect sizes for measures of language: in all cases the pupils with DLD were demonstrating significantly greater difficulties. By contrast, and as expected, the pupils with ASD were significantly more impaired on the measure of autism symptomatology, again with a large effect size. Apart from reading comprehension all non-significant effects had smaller effect sizes. British Ability Scales Matrices (BAS II; Elliott et al., 1997). Participants are presented with an incomplete pattern and are required to select the picture that will complete the pattern. The BAS-II technical manual reports modified split-half correlation coefficients as a measure of internal reliability (r = 0.79–0.92). Test-retest reliability is also reported (r = 0.64). Correlation with the Performance IQ scale from the Wechsler Intelligence Scale for Children 3rd edition (Wechsler, 1991) is reported as r = 0.47. In the British Picture Vocabulary Scale (BPVS-III; Dunn and Dunn, 2009), participants hear a word and select a referent from four alternatives. The BPVS-III provides norms for individuals aged 3–16 years. Reliability is reported as 0.91 and validity with the WISC as r = 0.76. In the Test for Reception of Grammar (TROG-E; Bishop, 2005), participants hear a series of sentences that increase in grammatical complexity and select a target from one of four alternatives. A computer is used to present items and record responses. The TROG-E provides norms for individuals aged 4 years to adult. High internal consistency is reported (r = 0.88) indicating good reliability; correlation with concepts and directions from CELF-3 (Semel et al., 2000) is r = 0.53. In the formulated sentences subtest of the CELF-4 UK (Semel et al., 2006), students are asked to formulate a syntactically and semantically correct sentence in response to an orally presented target word or phrase, with a stimulus picture for reference. Internal consistency is r = 0.75–0.89 and test-retest reliability r = 0.86. The SRS (Constantino and Gruber, 2005) was completed by teachers. Respondents are presented with a series of statements relating to autism symptomatology and indicate the frequency of their occurrence. The SRS generates a total score based on measures of social awareness, social cognition, social communication, social motivation, and autism mannerisms. Norms are provided for individuals aged 4–18 years. A high level of internal consistency was reported using Cronbach's alpha values for teachers (male α = 0.97 and female α = 0.96). Correlations between the teacher SRS and the subscales from the Autism Diagnostic Instrument-Revised (ADI-R) show high levels of validity (r = 0.52 to r = 0.70). The Single Word Reading Test (SWRT; Foster, 2007), in which children read a list of words, provides a measure of word reading accuracy for children attending primary schools. An extended version of the SWRT (with additional more difficult words) was used with children attending secondary schools (Stothard et al., 2010). These word reading tasks were untimed. The York Assessment of Reading for Comprehension (YARC Form A; Snowling et al., 2009; Stothard et al., 2010) provided a measure of reading comprehension for each participant at each time point. The primary and secondary versions of the YARC are aimed at children attending UK primary (4–11 years) and secondary (11–16 years) schools, respectively. At each time point, children read one passage and answered a series of open-ended comprehension questions, some of which referred to literal information contained within the text while others required an inference to be made. The child's age determined the version presented (primary vs. secondary) and their word reading score (SWRT) determined passage difficulty within each version. The YARC assessments can yield measures of text reading accuracy and/or rate but this depends on the version and passage completed. Since these scores were missing for many participants, we chose to report only the comprehension measure from the YARC, which was available for all participants, and use the SWRT as our measure of reading accuracy. The BAS-II (Elliott et al., 1997) spelling subtest. Students are asked to spell a series of single words. The BAS-II provides norms for individuals aged 5 years to adult. The BAS-II technical manual reports modified split-half correlation coefficients as a measure of internal reliability (r = 0.84–0.96 depending on age group). Test-retest reliability is also reported (r = 0.64). Validity has been established with the Wechsler Objective Reading Dimensions (WORD; Rust et al., 1993) at r = 0.63. Teachers completed the Strengths and Difficulties Questionnaire (SDQ: Goodman, 1997). The SDQ comprises 5 subscales: Hyperactivity, Conduct problems, Emotional symptoms, Peer problems, and Prosocial behavior. Screening cut-offs (www.sdqinfo.com) are available to identify children with “abnormal” levels of difficulties—the highest 10%ile from over 8,000 teacher ratings (Meltzer et al., 2000). Each item is scored 0–2, with subscale scores across 5 items ranging from 0 to 10; higher scores indicating higher levels of psychopathology (with the exception of the Prosocial behavior subscale where lower scores indicate higher levels of psychopathology). The Hyperactivity, Emotional symptoms, Conduct problems and Peer relationship subscales comprise the Total Difficulties scale (range 0–40). A bespoke questionnaire was developed for special educational needs coordinators (SENCOs) to provide information about support for the pupils with DLD and ASD attending their schools. Specifically, we asked SENCOs to comment on: specialist provision made within the school for the specific child in the study (e.g., from TAs, SENCOs or a resource base); support from professionals external to the school (in particular SLTs and EPs); administrative and other support (e.g., time for writing reports, meeting parents); and special resources purchased outside normal school provision (e.g., specialist programmes). Data were reported in hours per week for in school support and hours per term for external professionals and administration time. All participants were assessed individually by a qualified speech and language therapist or a psychologist. The first testing session involved the screening measures. Three subsequent sessions occurred with pupils completing all assessments in a standard order. The SRS, SDQ, and the SENCO questionnaire were discussed with the SENCO who completed each in their own time and returned it to the research team. SENCOs completed the SENCO questionnaire at two time points: in the first year of the project and 2 years later. Ethical approval was provided for the study by the University of Warwick Humanities and Social Science Research Ethics Committee, which adheres to the British Psychological Societies guidelines for all phases of the study. Schools agreed to participate in the study in the first instance. Parents were provided with project information and signed an opt in consent for their child. All child participants were provided with written information about the project in a child appropriate manner prior to the commencement of any testing. This information was also read to the children and children made their response orally. This was noted by the researcher. Participants were informed that they could withdraw from the project at any point or from individual assessments. All data were entered into a data file with a 10 percent check for data entry accuracy. The first research question examining support and nature of provision between the two diagnostic categories was examined through a series of Chi square tests to examine distribution of the support provided. Stepwise linear regression examined the language, literacy, cognition, and diagnosis as predictors of the support provided to the children. Finally, a repeated measures ANCOVA evaluated the change in hours of support over the 18 month time period. The results are presented in four sections to address the specific research questions. A minority of SENCOs failed to complete the questionnaire at all and in some cases a questionnaire was only returned at one time point. Therefore, first we examined differences between participants where no questionnaire was received at the first time point, only one questionnaire was returned or the questionnaire was returned at both times. Section 2 explores the support provided for the participants with DLD and ASD. Section 3 examines the relationships between standardized measures of language, non-verbal ability and working memory, and the support provided. Finally, we examine changes in provision received by the pupils over time. One hundred and fifteen SENCO questionnaires were received from the schools during the first wave of the project (73% response rate; DLD = 71, ASD = 44) and 93 during the second wave, 18 months later (59% response rate; DLD = 47, ASD = 43). Questionnaires were received at both time points for 73 participants. We first examined whether there was a difference between the cohorts in response rate across the study waves (none, one questionnaire, or two questionnaires) to establish whether the questionnaires received reflected the total sample. There was no significant difference in response rate between pupils with DLD and those with ASD: χ2 (2, N = 157) = 1.67, p = 0.43. We further considered whether there were differences for pupils in receipt of free school meals and stage of the severity of SEN (school action plus or a statement of SEN). In both cases there were no significant differences in response rates (Eligible for free school meals χ2 (2, N = 157) = 0.24, p = 0.87; Level of reported need, χ2 (6, N = 157) = 9.60, p = 0.14). Nor were there significant differences in the pupils' age at screening [F (2, 156) = 0.28, ns). Finally, we explored whether pupils for whom we received questionnaires differed significantly on measures of non-verbal ability, language literacy and social, emotional and behavioral development. Table 2 provides means (SDs) and results of the ANOVAs for these comparisons. Post hoc Bonferroni comparisons were used for significant differences. As Table 2 shows, there was only one significant difference, where questionnaires returned for participants on two waves had significantly lower non-verbal ability scores than those returned on only one wave p = 0.03). No other results were significant. Table 2. Differences between pupils for whom questionnaires were either not returned, were returned at one point only or were returned at both study waves. We first considered whether pupils were receiving support both within the classroom and, in those schools which had then, a resource base. These data are presented in Figure 2A SLT support and Figure 2B school support. The majority of pupils were receiving some support by the schools 91.3 % (n = 105) and this did not vary by year group [X2 (3, N = 115) = 4.78, ns]. Only half the pupils were reported to be receiving support by the SLTs (51.3%, n = 59), and this did vary by year group [X2 (3, N = 115) = 15.83, p = 0.001]. As Figure 2A and b show, this difference is accounted for by the reduced numbers of pupils who received SLT support in Year 8 (second year of English secondary school) compared to the other years groups (all in primary school). Figure 2. (A) Distribution of support by year group provided by SLTs for the children with DLD or ASD. (B). Distribution of support by year group provided by schools for the children with DLD or ASD. SLT, speech and language therapist. The number of hours and the way support was delivered by the schools and SLTs is reported in Table 3. As Table 3 shows, reported hours of SENCO pupil support were low as was support provided by SLTs in a clinic. By contrast mean TA weekly support was high but the standard deviations indicate a wide range of support provided for the participants. Support was also provided in different ways, 1–1 or group. Table 3. Mean (SD) hours support reported by SENCOs during wave 1. We explored whether the manner in which support was provided (1–1 or group) varied by diagnostic category and year group. Given the skewed nature of the data, non-parametric analyses (Mann–Whitney U and Kruskal–Wallis H tests) were used to compare the mode of support in hours that the pupils received by TAs and SLTs. As pupils could receive both 1–1 support and group support analyses for TA and SLT support were computed separately. School TA support varied significantly by diagnostic group, where children with ASD were more likely to receive 1–1 help from TAs (U = 2110, p = 0.001, r = 0.31) and children with DLD more likely to receive group work with TAs (U = 1214, p =0.04, r = 0.19). 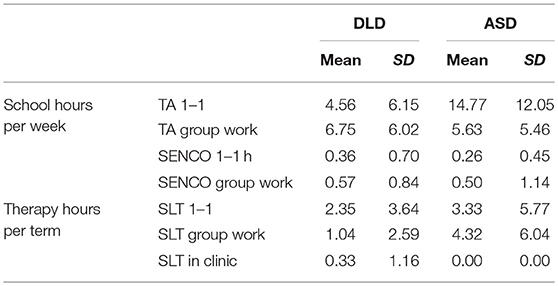 By contrast, there were no significant differences between the cohorts in the way in which either SENCO (1–1 U = 1,577, ns; group U = 1,384, ns) or SLT support was provided (SLT 1–1 U = 1708, ns; SLT group U = 1,780, ns). There were no significant differences across the age groups in TA 1–1 support [H(3) = 2.02, ns] or TA group support [H(3) = 2.75, ns]. Nor did SENCO group support differ across age groups [H(3) =0.97, ns]. However, SENCO 1–1 support occurred significantly more for the older children [age group 11–12, H(3) = 9.66, p = 0.02]. There was also a statistically significant difference between the four age groups for 1–1 hours of support per term for SLTs [H(3) = 12.39, p =0.006] with pupils in the youngest age group receiving the most 1–1 SLT support and those in the age group 11–12 receiving the least. There was no significant difference across age groups in SLT group support [H(3) = 4.29, ns]. We reasoned that total hours of support provided by the schools and SLTs would provide a more sensitive level of identified need. Total hours of weekly support were calculated by school and monthly hours of support by SLTs. In all cases pupils with DLD received significantly fewer hours of support than those with ASD, with medium to large effect sizes. School hours of support including resource base: DLD: M = 10.85, SD = 8.89; ASD: M = 18.85, SD = 13.62 t(65.84) = −3.33, p = 0.001, d = 0.67; school hours of support excluding resource base DLD: M = 8.49, SD = 8.1; ASD: M = 14.91, SD = 12.04 t(67.08) = −3.13, p = 0.003, d = 0.63); and a small effect for hours of SLT support DLD: M = 2.45, SD = 4.09; ASD: M = 4.43, SD = 6.57 t(65.84) = −1.97 p = 0.05, d = 0.36. Finally, we examined termly support in hours provided by school administration and services external to the school for the identified pupil. School time was primarily related to teacher (M = 2.15 hours per term) and SENCO time (M = 2.55 hours per term). External support was extremely rare with most schools reporting no support; the most support was provided by educational psychologists (M = 0.23 hours per term). Over 90 per cent of the pupils were receiving additional support by school staff and 50 percent from SLT services, although there was a significant and marked decline in SLT services in secondary schools. Although the manner in which the support was provided to pupils with ASD and DLD did not differ, the pupils with ASD received more total hours of support from both school staff and SLTs than those with DLD. Support was measured in terms of the numbers of hours of school support and SLT support provided to the pupils. These were examined in relation to their performance on the standardized measures of non-verbal ability, oral language, social responsiveness and behavior, which represented our measure of need. 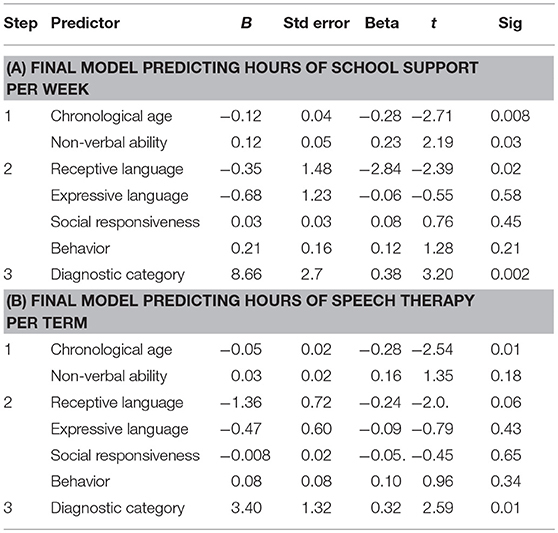 As Table 4 shows, hours of school support was significantly associated with hours of speech therapy, scores on the SRS and the SDQ total and the internalizing and externalizing subscales. By contrast hours of monthly SLT support was not significantly associated with any of the within child variables. Table 4. Correlations between hours of support provided and scores on non-verbal ability, oral language, social responsiveness, and behaviora. We examined whether age, non-verbal ability, language levels, behavior or autism symptomatology predicted hours of support by school and by SLT services using two exploratory stepwise linear regressions. Age and non-verbal ability were entered first, followed by the measures of expressive and receptive language and social responsiveness and behavior. Finally, we added diagnosis as a dummy variable to establish whether additional variance was accounted for after the pupils' competencies were controlled for. Table 5 provides the final models for school support and SLT support. The model for school support was significant F(7, 114) = 5.28, p < 0.001 accounting for 26 per cent of the variance. Addition of both the social measures (SRS and SDQ) and diagnostic category resulted in significant adjusted R2 change (p < 0.001, p = 0.002 respectively). The final model includes as significant chronological age, non-verbal ability, receptive language and diagnostic group (adj R2 = 0.22). The model for SLT support was also significant [F(7, 114) = 2.75, p =0.01] accounting for 15 per cent of the variance. In this case only the addition of diagnostic category resulted in a significant adj R2 change and only age and diagnostic category remain significant in the final model (adj R2 = 0.10), although receptive language approaches significance. Table 5. Exploratory regressions examining predictors for: (A) hours of support a week in schools; and (B) hours of support per term by SLTs. Hours of support provided by schools and SLT services were examined over a 2-year time frame. We had data from schools for 56 pupils at both time points (DLD n = 31; ASD n = 25). A repeated measures ANCOVA was conducted to examine changes in hours of support provided over the time frame with group as the between measure controlling for pupil age. There was no significant effect of time [Wilks Lambda = 0.99, F(1, 53) = 0.54, ns] and no interaction with group [Wilks Lambda =0.026, F(1, 53) =0.88, ns] in terms of support provided by schools. By contrast there was a significant change in hours of SLT support [Wilks Lambda = 0.79, F(1, 45) = 12.18, p = 0.001, partial eta squared 0.21] and a significant interaction by age [Wilks Lambda = 0.87, F(1, 45) = 6.50, p = 0.014, partial eta squared 0.13) but not group [Wilks Lambda =0.99, F(1, 45) = 0.33, ns]. To further address the age effect, we computed a change score by subtracting the hours of SLT support that pupils received at the second time point from the hours of support of SLT they received at the first time point. The greatest reduction in hours of support by SLTs was evident in the children who were 9 years and younger at the first point of assessment. The current study used data from children and young people in mainstream schools to examine the nature of support provided to pupils with either DLD or ASD. The findings indicated that there were important differences in the support received by different pupils and also between the DLD and ASD groups. Our results suggest that although support is being provided both to pupils with DLD and those with ASD, the relationship between both the amount and characteristics of the support received by the pupils with DLD and those with ASD is not consistently related to their relative abilities and educational needs. This finding indicates the potential for inequity. Both the DLD and ASD groups were receiving additional support but the support from SLTs dropped significantly between the primary age groups and the Year 8 group, who were then attending secondary schools. This pattern of limited SLT support at secondary level in English schools is well-established (Lindsay and Dockrell, 2002). Although some reduction may reflect improvements in language ability that were not captured by our measures, it is also the case that many young people continue to have language learning needs that could benefit from individual SLT intervention (See Ebbels et al., 2017; Wright et al., 2018). Direct support from SENCOs was low as was SLT support in a clinic. The latter resonates with the shift from SLTs predominantly working within clinics at the time of the Warnock Report (Department for Education and Science, 1978), to the current focus on working within schools (Ebbels et al., 2019). The main support in the present study was from TAs, who provided both 1–1 and group work. This is a major development since the Warnock report when TAs were not mentioned. Rather, the report refers to ‘ancillary workers, sometimes called non-teaching assistants' (para 14.32). At that time, the perceived need was for pupils with physical disabilities, severe learning disabilities, or emotional or behavioral disorders but there was also recognition of the benefits of an ancillary worker generally ‘for each child who needs such support' (para. 14.32). Furthermore, the overall level of support provided to pupils with ASD was greater than that provided to those pupils with DLD; and pupils with ASD were more likely to receive 1–1 TA support whereas pupils with DLD were more likely to receive support in smaller groups. These two different approaches to provision broadly reflect the tiered approach to addressing children's SEN. Tiered intervention models generally divide intervention into three different levels, waves, stages or tiers (e.g., Law et al., 2003; Gascoigne, 2006; Snow et al., 2015; Fuchs and Fuchs, 2006). In these frameworks the highest level of need (Tier 3) typically reflects individualized intervention devised by an SLT or professional for a specific child and aims to improve specific skills. By contrast, Tier 2 interventions are considered to target less severe problems and the support is often provided in small groups. Within this framework, the pupils with ASD were more likely to receive Tier 3 support, and pupils with DLD to receive Tier 2 support. Teaching assistant support was about three times greater for the ASD group than the DLD group (see Table 3). This likely reflects the increased level of social, emotional and behavioral difficulties in the ASD group (see also Charman et al., 2015). 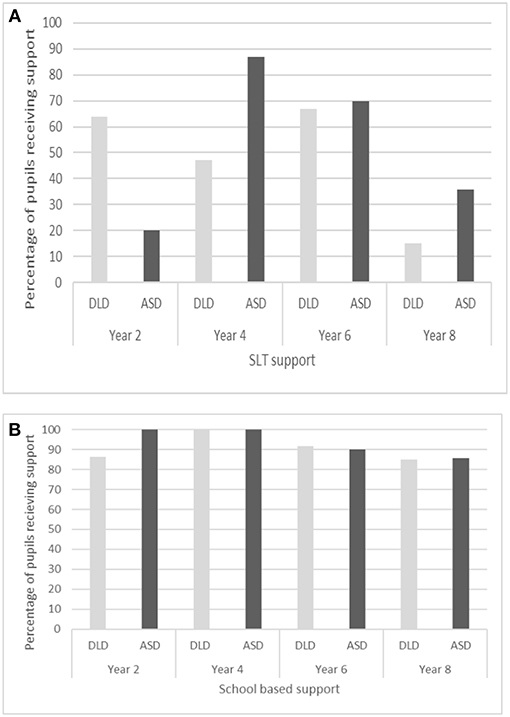 More surprising, however, is the significantly higher levels of SLT support for the ASD group, especially for the use of group work which was over four times greater. It is the case that children and young people with ASD may have language learning needs. However, the level of language learning needs in ASD is variable (Loucas et al., 2008), as was observed for our sample. Notably, the DLD group had significantly lower levels of language ability than the pupils with ASD, with moderate to large effect sizes. A similar pattern was also found for spelling and reading accuracy, although not reading comprehension: see also (Dockrell et al., 2015). Despite greater needs in these domains, the pupils with DLD received significantly lower levels of SLT support than the pupils with ASD. The relative importance of group (DLD or ASD) as a predictor of support received was also demonstrated by the results of the regression analysis. For both hours of school support (per week) and SLT support (per month) diagnostic category added significantly to the models once language, literacy, and cognition were accounted for. In the final model for SLT support no additional standardized assessments of language, literacy or cognition explained variance. By contrast school support was also explained by non-verbal ability and receptive language. It is likely that children with poorer receptive language and lower non-verbal ability require more differentiated instruction reflected in the greater support provided in schools and the challenges with intervening to impact on poor receptive language (Reilly et al., 2015). These data raise questions about the ways in which decisions are made about the provision allocated to specific pupils, both by schools and also by SLT services. Importantly, when we considered change in provision over time, whereas no differences were evident in support provided by schools, SLT support reduced significantly in upper primary school. This reduction cannot simply be explained by the move to secondary school and the reduced numbers of SLTs in those settings. Rather the data speak to a greater emphasis by SLTs in early intervention, independent of the pupils' level of language difficulties (see Ebbels et al., 2019). The current study was the first attempt to map provision provided to children with DLD or ASD within education settings; while response rate for the SENCO questionnaire was high (73 per cent) at the first collection point, the response rate at the second time point was 59 per cent, and the submission for children at both time points were markedly lower (43 per cent). Importantly whereas data were available about the hours of support children received, there were no data about the content or nature of that support. It may be that the SLTs were working with pupils with ASD in terms of social skills and social interaction, for example. Additionally, we have not captured pragmatic language difficulties in a detailed way. There is increasing evidence that children with ASD have greater difficulties with pragmatics, than those with DLD, and such problems may have a greater impact on the ways in which children's difficulties are manifested in the classroom and the resulting additional support which is reported to be in place. The nature of support for children with SEN has changed greatly since the Warnock Report. The use of TAs has increased exponentially and is the most prevalent form of within-school support in England. In addition, the pattern of SLT support has changed from largely within-clinic to within-school models. Our research has indicated, however, that at least in the case of pupils diagnosed with DLD or ASD, support provided may not be equitable. In the current study there is very clearly a higher level of support for pupils with ASD compared to those with SLD, even support from SLTs, which did not correlate with the needs revealed by individual assessments of each group. The need to move away from discrete categorization systems is not new (see for example Florian et al., 2006). The current data further highlight that discrete categorical systems do not reflect the children's needs to guide effective provision. This raises serious questions about the allocation of support resources and, by corollary, indicates the likelihood currently of an inequitable allocation of support to children and young people with DLD. JD was principal investigator for the study and completed the first draft of the paper and all the analyses. TC and GL were co-investigators. JR and OP were post docs on the project supporting conceptualization and leading on data collection. This project was part of the Bercow Review Better Communication Research Programme funded by the UK Government Department for Education. American Psychiatric Association (2013). The Diagnostic and Statistical Manual of Mental Disorders, 5th Edn. Washington, DC: American Psychiatric Association. Bercow, J. (2008). The Bercow Report: A Review of Services for Children and Young People (0-19) With Speech, Language and Communication Needs. Nottingham: DCSF Publications. Bishop, D. V. M. (2003). Children's Communication Chacklist (CCC). London: Pearson. Bishop, D. V. M. (2005). Test of Reception of Grammar Electronic (TROG-E). London: Harcourt Assessment. Bowyer-Crane, C., Snowling, M. J., Duff, F. J., Fieldsend, E., Carroll, J. M., Miles, J., et al. (2008), Improving early language literacy skills: differential effects of an oral language versus a phonology with reading intervention. J. Child Psychol. Psychiatry 49, 422–432. doi: 10.1111/j.1469-7610.2007.01849.x. Constantino, J. N., and Gruber, C. P. (2005). Social Responsiveness Scale (SRS). Western Psychological Services. Department for Education (2015). Special Educational Needs and Disability Code of Practice: 0 to 25 Years. London: Department for Education. Department for Education (2018a). Special Educational Needs in England: January 2017. Department for Education and Science (1978). Special Educational Needs. The Warnock Report. London HMSO. Dunn, L. M., and Dunn, D. M. (2009). British Picture Vocabulary Scale, 3rd Edn. London: GL Assessment. Elliott, C. D., Murray, D. J., and Pearson, L. S. (1997). British Abilities Scales II. Windsor, ON: NFER-Nelson. Foster, H. (2007). The Single Word Reading Test 6–16. London: nferNelson Publishing Company Ltd.
Gascoigne, M. (2006). Supporting Children With Speech, Language and Communication Needs Within Integrated Children's Services. London:RCSLT Position Paper, RCSLT. Kjelgaard, M. M., and Tager-Flusberg, H. (2001). An investigation of language impairment in autism: Implications for genetic subgroups. Lang. Cognit. Proc. 16, 287–308. doi: 10.1080/01690960042000058. Meltzer, H., Gatward, R., Goodman, R., and Ford, T. (2000). Mental Health of Children and Adolescents in Great Britain. London: The Stationery Office. Rust, J., Golombok, S., and Trickey, G. (1993). Weschler Objective Reading Dimensions. Cambridge, UK: Harcourt. Rutter, M., Tizard, J., and Whitmore, K. (1970). Education, Health and Behaviour. Harlow: Longman. Semel, E., Wiig, E., and Secord, W. (2000). Clinical Evaluation of Language Fundamentals, 3rd Edn. London: Pearson (CELF-3UK). Semel, E., Wiig, E., and Secord, W. (2006). Clinical Evaluation of Language Fundamentals - Fourth Edition (CELF - 4 UK). London: Pearson Assessment. Sharples, J., Webster, R., and Blatchford, P. (2015). Making Best Use of Teaching Assistants: Guidance Report. London: Education Endowment Foundation. Snowling, M. J., Stothard, S. E., Clarke, P., Bowyer-Crane, C., Harrington, A., Truelove, E., et al. (2009). York Assessment of Reading for Comprehension. London: GL Assessment. Stothard, S., Hulme, C., Clarke, P. J., and Snowing, M. (2010). The York Assessment of Reading for Comprehension–Secondary Text. London: GL Assessment. Wechsler, D. (1991). Wechsler Intelligence Scale For Children, 3rd Edn. New York, NY: Psychological Corporation. Copyright © 2019 Dockrell, Ricketts, Palikara, Charman and Lindsay. This is an open-access article distributed under the terms of the Creative Commons Attribution License (CC BY). The use, distribution or reproduction in other forums is permitted, provided the original author(s) and the copyright owner(s) are credited and that the original publication in this journal is cited, in accordance with accepted academic practice. No use, distribution or reproduction is permitted which does not comply with these terms.